Two groups of bloggers emerge from our survey: Those who view their blogs as a personal, and somewhat private, hobby and a smaller group who view their blogs as more time-consuming, and more public, endeavors. For both groups, the primary motivations to blog are to express themselves creatively and to record their personal experiences. For most, blogging is a hobby, not an activity that consumes their lives. When asked “What does your blog mean to you?” the largest group of bloggers (44%) replied that their blog is “something I do, but not something I spend a lot of time on,” a point that meshes with the findings that bloggers do not update their blogs very frequently and do not spend much time updating their blogs in any given week. Only 13% of bloggers post new material every day. The typical blogger spends five hours per week updating his or her main blog. Another sizable contingent of bloggers (40%) describes blogging as a hobby that they enjoy working on when they can. There is a smaller core of devoted users, just 13%, who say that their blog is very important to them, and describe it as a big part of their life. Not surprisingly, those who say blogging is an important part of their life are more apt to update their blog frequently. This small group is also more likely to earn money from their blog, via advertisements, tip jars or paid content, and to consider their blog a form of journalism. Blogging is usually the first foray into authorship; bloggers blog to express themselves creatively and share personal experiences. Sixty-two percent of bloggers did not have a personal website before launching their blog and 54% of bloggers had not published their writing or media creations anywhere else, either online or offline. Three in four bloggers (77%) told us that expressing themselves creatively was a reason that they blog. 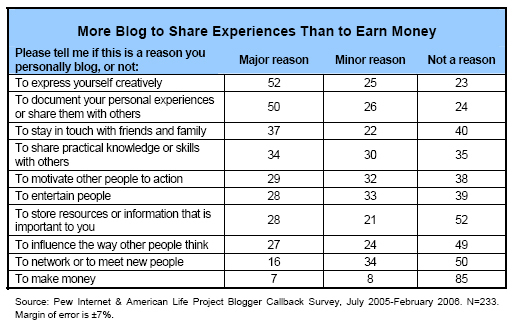 Younger and lower-income bloggers were more likely than other groups to give this as a reason to blog. Similarly, most bloggers (76%) say that they blog to document their personal experiences and share them with others. Younger users were among the most likely to say that they blog to document and share their lives. Bloggers are also anxious to share what they know with others. Fully 64% of bloggers say that they blog to share practical knowledge or skills with others. Older bloggers (age 50-64) are the most likely group to say this is a reason to keep a blog. More than six in ten bloggers (61%) say they blog to motivate other people to take action, and a similar percentage say they blog to entertain. Older, wealthier bloggers are more likely to list motivating others as a major reason to blog. Men are more likely than women (67% to 52%) to say that they blog to entertain people. Another 60% of bloggers say they blog to keep in touch with family and friends. Women who blog and younger bloggers (age 18-29) are more likely than other groups to say that keeping in touch is a major reason for blogging. About half of all bloggers say they blog to network or meet new people, and half say they blog to influence the way other people think. Younger bloggers (age 18-29) and lower income bloggers are more likely than other groups to say they blog to meet new people. Male bloggers are more likely than female bloggers to blog to influence others. About half (48%) of bloggers say they use their blog as a storage site or memory device. Older bloggers (over age 50) are more likely than younger bloggers to say that storing resources or information that is important to you is a main reason they publish their blog. The least common reason people blog is to make money. Only 15% of bloggers report this as a reason for their blog-keeping, and just 7% call making money a major reason. Bloggers over age 30 are more likely than younger bloggers to give making money as a reason to blog. Most bloggers do not confine themselves to one topic. Nearly two-thirds of bloggers (64%) say they blog on a lot of different topics. The remaining third (35%) say they focus on one topic. Older bloggers (over age 30), higher-income bloggers and parents who blog are more likely to say that they blog about one topic, while younger bloggers (age 18-29) are more likely to say that they blog about many different topics. Personal experiences are the most popular topic, but politics, entertainment, and sports are also frequently discussed. While blogs can address any conceivable subject, we asked bloggers to classify the main topic of their blog. The largest percentage of bloggers in our sample (37%) say that “my life and personal experiences” was the main topic. Women who blog and younger bloggers were more likely than other groups to say that they blogged mainly about personal experiences. Politics and government is the next most popular topic, with 11% of bloggers citing it as the main subject of their posts. Bloggers in their thirties and forties and college-educated bloggers were more likely than other groups to list this as a main topic, though still in lower percentages than personal journal-style blogging. Entertainment-related topics were the next most popular blog-type, with 7% of bloggers, followed by sports (6%)—a topic favored by more men than women—general news and current events (5%), business (5%), technology (4%), religion, spirituality or faith (2%), a specific hobby or a health problem or illness (each comprising 1% of bloggers). Other topics mentioned include opinions, volunteering, education, photography, causes and passions, and organizations. Personal experiences provide the most inspiration for bloggers. Bloggers are inspired, for the most part, by things that happen to them, or something they read or observe. More than three-quarters of bloggers (78%) say that a personal experience has inspired them to post. Only 12% say they have never posted about a personal experience. Women who blog and younger bloggers (age 18-29) are more likely than other groups to say they are often motivated to post by a personal experience. The news media also prove inspirational as 55% of bloggers report that they often or sometimes post because of something they heard or read in the news media. Bloggers frequently inspired by the news media tend to identify politically as Democrats or Independents. Republicans are also inspired to blog by the news, but less often than the other two groups. Other people’s blogs also instigate blog postings, with more than half of all bloggers (54%) reporting that something they read on another blog inspired a post. Entertainment media also stimulates the creative juices of bloggers – four in ten (40%) bloggers have often or sometimes posted because of a song, movie or television program they encountered. Younger bloggers (age 18-29) and those with lower levels of education are more likely than other groups to be inspired to post by entertainment media. And close to a third of bloggers are inspired by something else: religious faith, books they have read, holidays or seasons, or the experiences of others. Half of bloggers keep one blog and most do not share authorship with anyone else. There is not necessarily a one-to-one relationship between bloggers and blogs. A little more than half of all bloggers (53%) have just one blog, but another 17% have two blogs, and 26% author three or more. Of bloggers who report having more than one blog, more than half (61%) say that they have three or more blogs. Not surprisingly, bloggers with more blogs report spending more hours per week on average tending their blogs than do single-author bloggers. It is also not clear whether all of the blogs of multi-bloggers are currently active. In addition to individual bloggers with multiple blogs, sometimes a single blog has multiple authors. Nearly three in ten bloggers say that their primary blog is a multi-author blog. Seven in ten say that they are the only author of their main blog. Bloggers who are the sole author of their blog are more likely to report that they blog for themselves rather than for the benefit of their audience. On the other side, bloggers who post on group blogs are more likely to report that they blog more for their audience than for themselves. More than half of bloggers use a pseudonym. Blog content that is appropriate or even funny for a friend can also be cause for dismissal to a supervisor or employer. To avoid the problem of colliding life spheres and to protect personal privacy, many bloggers use a pseudonym to keep their offline life separate from their online thoughts. In fact, a bit more than half of bloggers (55%) surveyed say they blog under a pseudonym or made-up name, while 43% say they blog using their real name. Only a third of bloggers think their blog is a form of journalism. While others sometimes characterize them as journalists, bloggers themselves generally do not think of what they do as journalism. 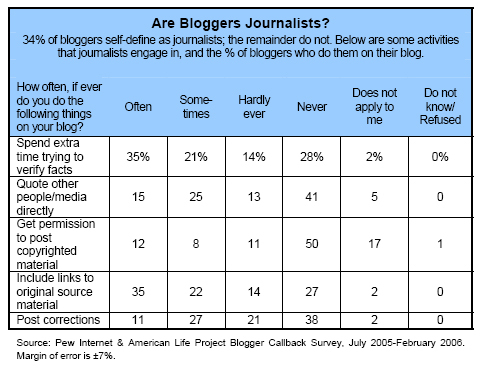 Only a third of bloggers (34%) say that their blog is a form of journalism, while two-thirds (65%) say it is not. To probe further into this question, we asked bloggers whether they engage in practices generally associated with journalism: directly quoting sources, fact checking, posting corrections, receiving permission to post copyright material and linking to original source materials outside of the blog. Overall, the most frequently reported journalistic activities are spending extra time verifying facts included in a posting, and including links to original source material that has been cited or in some way used in a post. Just a bit more than a third of bloggers (35%) say they have done these two activities “often.” Another 22% say that they “sometimes” engage in these practices on their blog. Verification of facts was more likely to be reported by bloggers over age 30 and those with a college degree. Those with greater levels of education were more likely to link to original source material than those with less formal education. Just one in seven (15%) bloggers say they quote people or other media directly on their blog “often,” and another 12% of bloggers say they often seek permission before posting copyrighted material to their blog. Conversely, more than two in five bloggers say they “never” quote sources or other media directly in their blog. Women who blog, younger bloggers, and those with less education are more likely than other groups of bloggers to report “never” quoting directly. Just 11% of bloggers often post corrections on their blog.